Yesterday got away from me. It arrived and was gone. Speedy quick. But that's just fine BECAUSE the day left me completely, absolutely, fabulously IN LOVE. YES! That is correct. 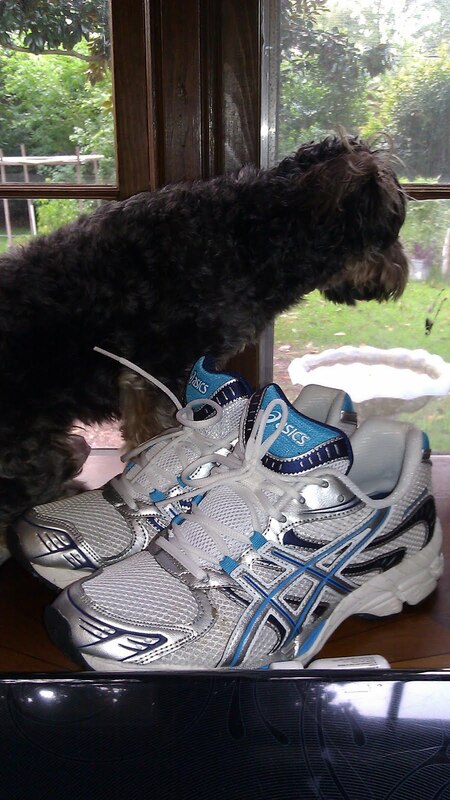 I got a new pair of shoes for my 5 mile walks. I went out yesterday morning on a mission and I was not going to return home without new shoes. I started at Kohl's because I knew that they sell Asics and New Balance--Asics because BestSonInLawEVER told me, in his best I'mawonderfulChiroprator voice that those would be the best shoes for me; New Balance because many lovely friends suggested them. I abhor looking for shoes so this was going to have to be fast in order to be relatively painless. And I knew that the fact I had to have a wide width was going to slow me down. Especially when that fact was coupled with the matter that I won't wear ugly shoes (and there are some out there that are truly U.G.L.Y.). My initial search turned up nothing. Zip. Zero. Nada. Until I noticed a pair of Asics on the bottom shelf and the tag thingy on the shoe had 4 glorious words: Available in wide widths. SCORE! Except that they neglected to put the second sentence that should have read: But NOT in THIS store. FAIL. All was not lost, however, because on another row there were some New Balance shoes 'Available in Wide Widths.' PROBLEM- they were stark white with a blue N on the sides. I am NOT wearing stark white shoes. Not going to happen. EVER. On to Rack Room. Upon entering the store I was immediately confused. The set up is weird. I finally found the women's section but NOT ONE SINGLE ATHLETIC SHOE was in sight. I searched up and down the women's aisles and couldn't find any. There were some in the kids' section but those would hardly do. I turned around to ask for help when fate intervened and saved me from total embarrassment. The athletic shoes were the first shoes I SHOULD HAVE SEEN upon entering the store. As in, I walked right past them. Athletic shoe after athletic shoe was either a B width, had D widths but NOT in my size (seriously, who wears a 5 or 6 1/2), OR were just plain UGLY. Right away, I'm annoyed. And who could blame me? I had already been in one store for AT LEAST 30 minutes and I had been looking in this one for AT LEAST 15! Geez. And then, I saw them. A really nice looking pair of Asics. SCORE! Except- NO wide widths. FAIL! LOVE. It was LOVE I tell you! My toes could dance around in those shoes- DANCE! AROUND! I nearly skipped up to the register and felt like hugging the cashier. My mood was at level EXUBERANT! And, yes, she WAS looking at me like I might have been an institution escapee. I did not care! And it had nothing to do with the fact that my new shoes are sporting CAROLINA PANTHER colors! My Carolina Asics! And Tucker- who had just spotted a squirrel in the back yard! Yea! It means everything when you have happy feet. On with the 5 miles! I enjoyed your guest post yesterday. I tried to post something but it just disapeared. Anywho, It was very good. Can I ask, how long is it taking you for your 5 miles? So far I have only made it to 2 miles, and lost 5 lbs! Glad you finally found some shoes that really fit you well. I'd totally forgotten about Asics. I'm going to have to check those out next time I need a new pair. Pls give Tucker a big hug for me. Glad you've found some great shoes! Love the colors - and no, I wouldn't wear white either. Blue letters or not. You're walkin' now. I have a theory that everyone wears size 9.5 because there never are ANY when I'm shopping. You're right - who wears those little sizes? No one. That's why there are so many on the shelves. My story and I'm stickin' to it. Trust Tucker to get in on the action!!! Seriously, I;m so pleased that you finally found a pair of shoes that were lovely & comfortable for you, AND they look good as well. Ker-ching!! I did laugh when you said that you were looking for athletic shoes. I had visions of these shoes running around the shop,jumping over hurdles etc. etc.! (But that's just me being silly!!). Susan-Thank you so much! I really appreciate it! It takes me about an hour and a half to walk 5 miles. And, by the time I'm on that 5th mile, I am ready to stop walking! Congrats on the 5 lbs! Woot! Woot! HEY- there's a new challenge starting soon if you're interested! Michele- GET SOME! You will LOVE them! Gave Tuck a hug for ya and he sent you a sloppy puppy kiss back! Carol- Too funny! LOL You have a good one too! Diane- These shoes have made all the diff! I would sleep in them but they are quite THAT comfortable! LOL You are too funny! DoodleBug and I got a laugh from your athletic shoe visual! I too thought they were heels, and for some reason I pictured red heels! I'm the one who wears those small shoes, but before you get jealous, I've an old injury which means if I wear heels, my left foot swells up, so no heels, or only on very special occasions! Congrats the new shoes are lovely, you'll skip along the 5 miles in them! Good for you. I'm so happy that your feet are happy!!! Mimi- No heels for me! Not even when I was young and foolish- LOL I don't know about skipping along those 5 miles, but my feet surely will not be hurting anymore! Yay! Thanks! Betty- the shoes make ALL THE DIFF! I promise! lol..too funyy! I feel your pain, I wear a size 11 and have the hardest time finding cute shoes. Love your choice! I love your new walking shoes. I go through walking shoes so fast. I wonder if it is because I walk so much?? Haha, I think it is how hard I am on them. I am so glad you found them. I really like the colors. A good pair of shoes make all the difference! Congrats on finding a pair. FG- Thanks! I think I'm going to be going through them faster now myself. I'm looking for my next pair already so they'll be here when I'm ready! Desiree-It's horrid, isn't it?! Hubs is glad I'm like that though! LOL Thanks! Beverly- Yes they do! thanks!